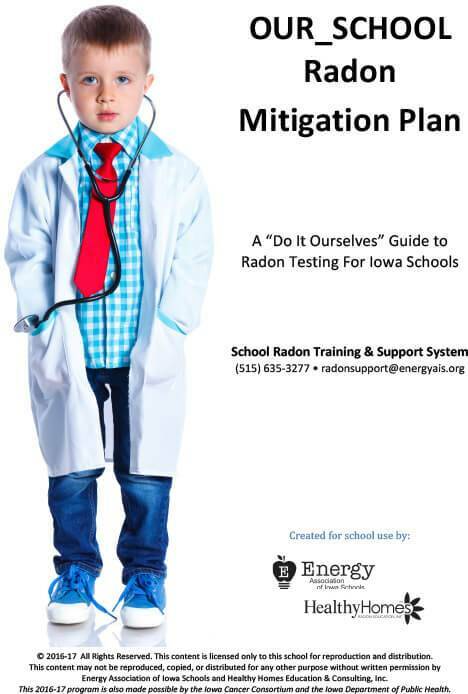 18 school districts in Iowa are on their way to having peace of mind when it comes to radon safety in their buildings. Thanks to funding received by Energy Association of Iowa Schools (EAIS) from the Iowa Cancer Consortium and Iowa Department of Public Health, these districts will learn to test their own buildings to ensure levels are below the Environmental Protection Agency’s suggested radon action level of 4 pCi/L. If levels happen to be higher, the schools will have support to mitigate the issue. These school districts voluntarily registered to participate in the School Radon Training & Support System (SRTSS) Expansion Project. As participants, they will each receive a matching grant of $1000 toward training and test kits, as well as access to a $4000 mitigation assistance fund to be shared as needed. While EAIS is out of grants, more Iowa school districts are welcome to sign up. Please contact Julie Weisshaar for more information.